Delaney Nothaft from Tempe, AZ wins first gold ball at USTA National Hard Court Championships. USTA Southwest juniors Delaney Nothaft and Nathan Ponwith added a bit more hardware to their trophy cases last week, bringing home some impressive bling from the USTA National Hard Court Championships. Nothaft (pictured left), of Tempe, Ariz., captured her first gold ball in the Girls 12s’ division, partnering with Samantha Martenelli of Denver to win. The duo, seeded fourth, won five rounds, including back-to-back nailbiters in the semifinals over the No. 1 and 2 seeds respectively. In the semifinals, Nothaft-Martinelli took out Catherine Bellis (Atherton, Calif.) and Ryan Peus (Santa Barbara, Calif.) 6-7, 6-4, 7-5. The final round proved to be even closer. After dropping the first set, Nothaft and Martinelli regrouped to win the next two for a 3-6, 6-3, 7-6 (4) victory over Kayla Day (Santa Barbara , Calif.) and Michaela Gordon (Los Altos Hills, Calif.). Though she was ranked a very respectable No. 25 in the nation in singles coming into the tournament, Nothaft has fared even better in doubles. The last four national age group 12s tournaments (Hard, Clay, Spring and Winter Nationals) she has made at least the semifinals or better. Her previous best was a final-round appearance at the Winter Nationals in Tucson, pairing with Martinelli. The Girls 12s event was held at the Windward Lake Club in Alpharetta, Ga. In other junior results from USTA National Hard Courts week, Scottsdale’s Nathan Ponwith finished with a third-place finish at the Boys 14s event at McFarlin Tennis Center in San Antonio, Texas, teaming with Jake Devine of Boca Raton, Fla.
Ponwith - who also reached the Round of 16 in singles beforelosing to eventual titlist Cameron Klinger in three sets – smashed through four rounds with Devine in doubles. The pair was seeded fourth, but fell to seven seeds Ryan Dickerson (Marlton, N.J.) and Kyle Seeling (Hatfield, Penn.) 7-5, 7-5 in the semifinals. Ponwith-Devine rebounded in the third-place match defeating Kalman Boyd (Rancho Santa Fe, Calif.) and Crews Enochs (Marietta, Ga.) 7-5, 6-0. USTA National Hard Court Championships are one of the four premier junior events in the nation. Eight separate events (Boys and Girls 12s, 14s, 16s and 18s divisions) were held at various spot in the United States from August 6-14. 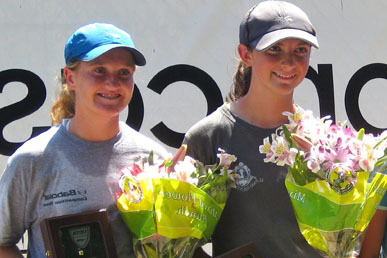 Winners of the Boys and Girls' 18s divisions are offered main draw spots into the 2011 US Open. The boys' 18s winner was Jack Sock (Lincoln, Neb.) and the girls' 18s winner was Lauren Davis (Gates Mills, Ohio). Below is the complete list of results from the finals of this week’s USTA National Championships. The complete draws are available on www.usta.com. Singles: (1) Jack Sock, Lincoln, Neb., d. (2) Mitchell Frank, Annandale, Va., 6-3, 6-0. Va., and Junior Ore, Gaithersburg, Md., 7-6(5), 6-3. Singles: (1) Lauren Davis, Gates Mills, Ohio, d. (4) Nicole Gibbs, Santa Monica, Calif., 7-6(3), 1-6, 6-4. Raton, Fla., and Kendal Woodard, Stockbridge, Ga., 6-4, 4-6, 6-3. Singles: (2) Ronnie Schneider, Bloomington, Ind., d. (4) Luca Corinteli, Alexandria, Va., 5-7, 7-6(3), 6-2. Poway, Calif., and Joseph Di Giulio, Newport Beach, Calif., 6-7(2), 6-1, 6-3. Singles: (3) Peggy Porter, Dallas, d. (15) Alyssa Smith, Laguna Niguel, Calif., 7-6(8), 6-4.
and Mia King, Hendersonville, N.C., 4-6, 6-0, 6-4. Singles: (2) Cameron Klinger, San Jose, Calif., d. (14) Jake Devine, Boca Raton, Fla., 7-6(8), 4-6, 6-1. Santa Fe, Calif., and Crews Enochs, Marietta, Ga., 6-3, 6-3. Singles: (1) Lauren Goodman, Fort Wayne, Ind., d. (6) Mia Horvit, Parkland, Fla., 6-2, 6-2. Conn., and Meghan Kelley, Falmouth, Maine, 6-0, 7-6(3). Singles: (2) Alexander del Corral, Doral, Fla., d. (1) Nathan Perrone, Mount Laurel, N.J., 6-2, 6-2. Greenville, N.C., and Alexander del Corral, Doral, Fla., 6-2, 3-6, 7-5. Singles: (1) Catherine Bellis, Atherton, Calif., d. (5) Michaela Gordon, Los Altos Hills, Calif., 6-1, 6-1. Calif., and Michaela Gordon, Los Altos Hills, Calif., 6-3, 3-6, 7-6(4).